Dear Comrades of WoT, the air date of the Girls und Panzer - The Last Chapter ( Saishuushou ) First movie is finally announced and it is set to be released in 9th December this year !! Now for those of who dont know Girls und Panzer - The Last Chapter will be a series of 6 movies that will be released in the coming years subsequently that will mark the end of Girls und Panzer. If possible I will keep updating this thread for for further information about the movies. Edited by pokeranger24, 20 March 2017 - 02:54 PM. Google translate result yield nothing really important. Seems there will be screening with 4dx/mx4d format later (i think). Seems there are also some live orchestra too. It is unveiled that the first episode of anime movie "Girls und Panzer - Final Chapter" will be screened in cinemas on Dec 9th. "Girls und Panzer - Final Chapter" is the latest work (in the GuP franchise) with a total of 6 episodes. This announcement also came with the release of teaser visuals. Also, this movie will also be screened in 4DX and MX4D formats! 4DX & MX4D formats of the episodes will be screened after Episode 2's (normal cinema format) screening, with both Episodes 1 and 2 presented together (in 4DX and MX4D).The remaining episodes (3-4 and 5-6) will also be released in 4DX & MX4D formats in the same way (2 episodes together at the end of the latter episode). 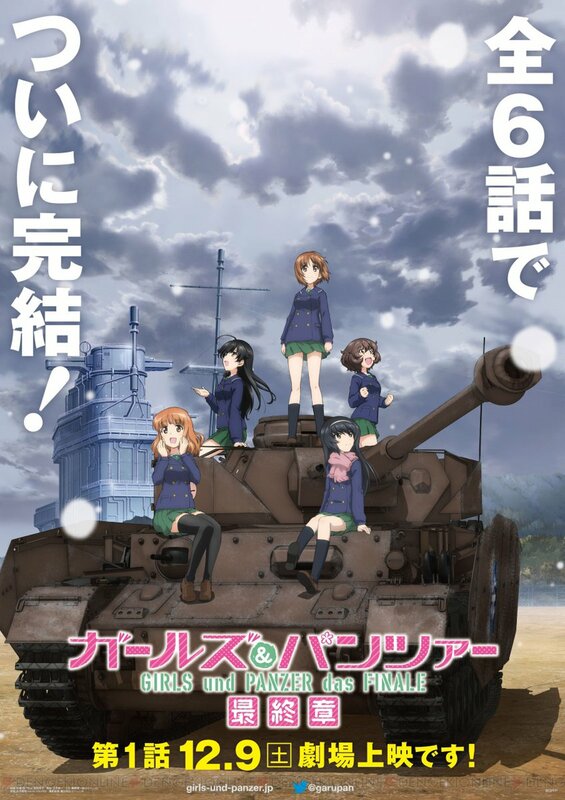 Girls und Panzer - der Filem Cinematic Concert to be held! Orchestral rendition of the film ost, matched with scenes from "GuP - der Filem". The Tokyo Philharmonic Orchestra will perform the concert, similar to previous orchestral concerts (of GuP). This deepens the sense of Tokyo Phil as the GuP Orchestra. Early bird booking are now opening, interested persons can check for further details on the official GuP website. Yoshioka Maya (seiyuu for Kondou Taeko, aka setter and radio op for the Volleyball team Duck, and Anzai Chiyomi, aka Duce, aka "Anchovy" ) and producer Sugiyama Kiyoshi will appear on the Anime Festa 2017 show. The school that Anzai Chiyomi (Yoshioka's character) belonged to, Anzio High, has some links with Tochigi Prefecture's schools (apparently Anzio's home is Tochigi Prefecture, much as Oarai's home is Ibaraki Prefecture, where the Oarai port city is located). and (Yoshiaki) has appeared twice before. Together with the TV appearance Tochigi TV will broadcast the TV series, the "This is the real Anzio battle!" OVA and the orchestral concert (of the TV series I guess). Unrelated note - The fireworks at the Ooarai-Kairaku Festa 2017 were pretty amazing (4K video youtube link). ANN has a comprehensive report of the whole thing in English here, including details of the various events as well as licensing milestones (Sentai Filmworks will release the film stateside in Nov this year with an English - urgh - dub). Edited by neokai, 31 March 2017 - 05:21 AM. LoL nice, I wanted to go to Ooarai myself. Edited by Jagdpanzer_General, 12 April 2017 - 08:39 PM. Beyond that, there's the gup official website (Japanese). A New Teaser We Found. 4months and 8 days away. Also, looks like the OVA is set on the Maginot Academy ship and the French tanks are 40s vintage... talk about Ooarai tech advantage. Edited by Wolvenworks, 09 August 2017 - 12:34 PM. They've been driving us nuts trying to track down interior drawings and schematics for the interiors of various tanks which are being added to the series. Including some you may find rather surprising. Aaand here there goes my money. Das Finale is Aproaching fast! Edited by Jagdpanzer_General, 08 October 2017 - 12:37 PM. Must be the 35min of talking and stuff with 5min of actual tank fight. They're trying to close down Ooarai again? In the trailer she said something about putting the fates of all the Ooarai girls on the line, it sounds to me like they're trying to close the school down again. Makes me remember, on spinoff manga that Dumb MEXT guy still want to close Ooarai. Or maybe The BC is the one that will closed down, and they will fight for their own Freedom. Edited by Jagdpanzer_General, 11 October 2017 - 08:59 AM.